Face.com lately has been in the news,is a start up that is focussing on a face recognition technology and they think its the best out there. They recently announced their Facebook app called Photo Finder to test their technology. However their plan seems to build face.com into a much bigger service and instead of being just a fbook app. If they can build a scalable backend to support a healthy traffic, they should be in for sometime to come. They are slowly uncovering sheets from their technology and starting to talk more about face. “Today we got our first chance to speak in public about face.com. It was at Techonomy, a great event that “delves into the business and economy behind the Web 2.0 technological revolution”. The 6 selected companies were all fresh, innovative, and very cool. Each company had its 7 minutes to speak followed by a round of questions and comments from the on-stage panelists. All the speakers put on a great show, and the tweets in the background kept the crowd engaged. Sarah Lacy wrapped up the event, giving a chance for the crowd to vote for their favorite company. We were very honored to be selected as the best in show by the crowd, for us it was great to get this recognition – thanks to all of those who voted! “We thought it might be helpful to review the Blyk business model in a bit more detail following our pre-launch analysis where we were bearish on the company. Its business model ties in nicely with our 2-sided strategy for operators about which we have written on numerous occasions on this blog. 1.How does Blyk make money? 3.What are the broader ‘Telco 2.0’ lessons for other operators? News flow from Blyk has been positive recently. It announced a few weeks ago that it has reached 200,000 customers in its first year of trading (versus its target of 100,000). This follows press releases in June that the company is set to expand operations in 2009 into other European markets, notably the Netherlands, as well as Belgium, Germany and Spain. All this follows investment (of an undisclosed amount) from Goldman Sachs and IFIC in January. The current squeeze on credit can hardly be helpful to an expanding start-up, but it looks like Blyk was lucky in securing funds ahead of the summer problems. 1.Termination charges from off-net callers. This is effectively shown in the lower diagram of the chart above where we show operators as both receivers of money from end users (when originating the call) and receivers of money from other operators (when terminating the call). 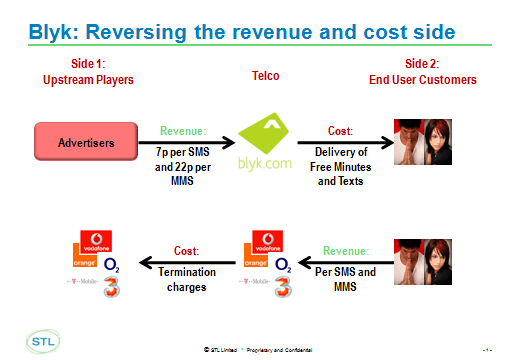 So every time a Blyk user receives a call or text from an off-net customer the originating operator pays Blyk for termination. In turn, Blyk obviously pays some of this termination charge out to its network supplier (Orange) but we guesstimate that the company still makes some margin on this. 2. Overage. Typically 16-24 year olds, like the rest of us, have a pre-determined communications budget – “I will spend £x on my phone each month”. 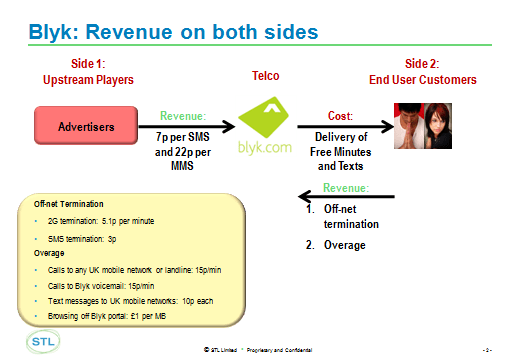 The fact that Blyk gives users free calls and texts does not stop users from spending this money. Blyk’s users will simply display the same behaviour that every Telco exec is familiar with: increased communications usage as the price reduces (see this excellent piece on elasticity and pricing from the Ericsson Business Review). Because Blyk offers 217 free minutes and 43 texts, we believe that users will be profligate with their communications. They will use this free allowance up and STILL spend at least some of their previous budget. Higher ARPUs. By introducing a second revenue source, Blyk can potentially more than double theARPU levels achieved by a traditional one-sided player. Strong appeal to advertisers. 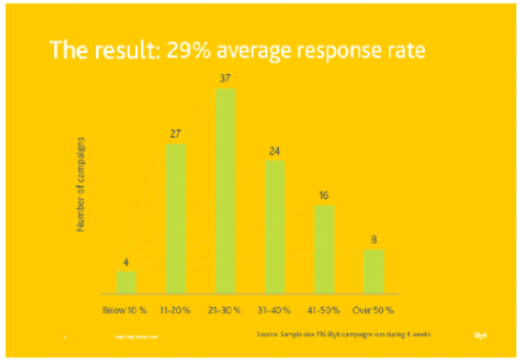 Response rates appear to be so good that advertisers cannot fail to be impressed with the Blyk platform as a means of communicating with a traditionally ‘hard-to-get-at’ segment. They certainly seem to have signed up plenty of high-profile brands including WDK(drinks), Penguin (books), Sky Box Office (TV), Local Government (elections), Brylcreem (male grooming products), Boots (Retail). There are lots of examples on the Blyk media portal. Strong appeal to youth market. 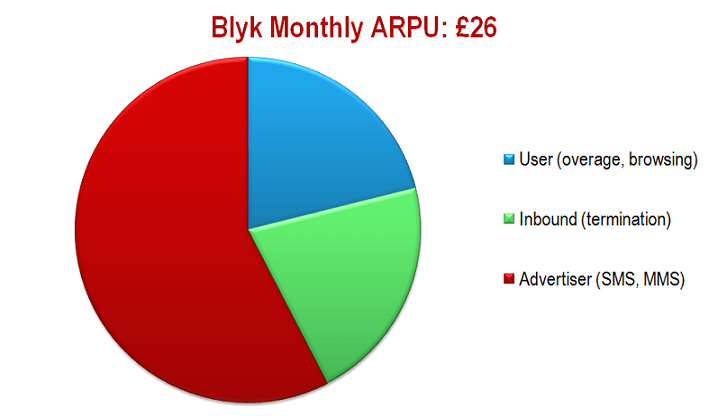 Students on a tight budget will be seeking value for money and Blyk offers this in spades in return for relatively limited intrusion (users receive a maximum of 2 ads per day). Speed to market. The simple approach to targeting (capturing user preferences when they sign up) is not particularly sophisticated and certainly way short of providing real-time behavioural targeting but it has allowed Blyk to launch and grow quite quickly – no operator has yet launched anything similar. 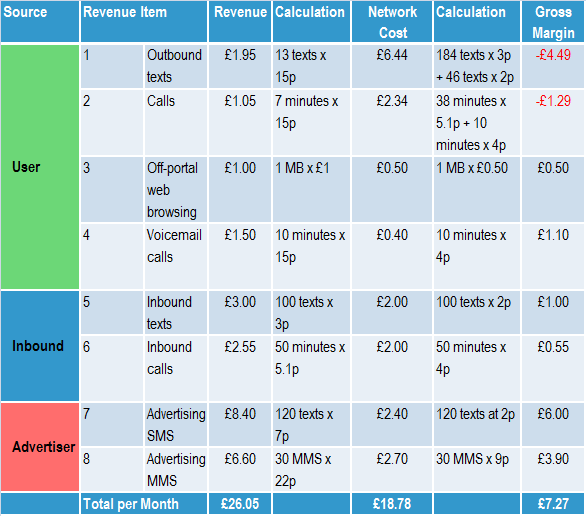 Network pricing. Because it is an MVNO, Blyk is to a great extent dependent on the prices charged by operators for network usage (for origination, transmission and termination). In a competitive market like the UK, these are unlikely to be excessive but there is a margin risk for Blyk if these rise. Blyk would presumably be able to pass on the increase on the revenue it generates on inbound minutes and text but this would not be enough to offset the margin hit. In our model, we calculate that a 10% increase in network costs would see gross margin drop from £7.27 per user per month (28%) to £5.95 (22%). It may make advertisers less inclined to use Blyk which would reduce the premium prices that Blyk can charge advertisers for SMS and MMS messages. Given that advertisers account for nearly 2/3rds of Blyk’s revenue, this would equate to a 18% revenue hit overall (assuming stable subscriber numbers). Operator competition. To date, no operators have followed Blyk into the youth market with an ad-funded model. But if Blyk shows signs of success, you can be sure that other operators will look for a piece of the action. Orange, Blyk’s network provider, has a youth skew and if it sees ad-funding as providing incremental value (rather than cannibalising subscriber revenues), then they are likely to follow suit. And Virgin also has a strong youth bias and could potentially copy the Blyk model relatively easily. Moves such as these are likely to drive prices down for advertiser media purchases. Scalability. Even if Blyk could capture a large proportion of 16-24 year olds (which seems unlikely in saturated and competitive European markets), the cost Blyk spends on acquiring customers is likely to mean that EBITDA margins will be razor thin. Our 28% gross margin excludes operations, customer care (where it looks like they have had some problems) and marketing and sales costs. The latter is particularly concerning since Blyk uses people at university campuses to sign up prospects and capture profile information. This simply doesn’t scale effectively and the sign-up and data capture process will need to be automated as Blyk grows to improve both efficiency and the effectiveness of targeting. Growth – eats itself. Ironically, it is because Blyk is so small that we calculate that 25% of its revenue could come from inbound termination of off-net calls and messages. If the company grows and more and more call and texts are on-net, Blyk continues to pick up the costs without the associated termination benefit. Like the voice arbitrage players, that make money by using the internet to reduce voice and fixed calls, it is to some extent a beneficiary of its small size for if it grows it loses a key revenue stream. 1. 2-sided market opportunity is real. Perhaps the most obvious lesson for other operators is that there is value in 2-sided markets! Blyk may struggle to make a return for the reasons mentioned above, but it has already done enough to show that for operators with large existing (youth) customer bases the ad-funded model could be fruitful. We think this also shows the wider potential for 2-sided opportunities in the areas outlined in our report on the subject. 2. Different Business Model = Different Business! It is not mere marketing fluff that Blyk refers to itself as a media company rather than a MVNO. It shows that Blyk’s management considers the advertising community as its primary market and end users as ‘members’ rather than customers. This is important – a different business model is a different business. A two-sided approach for operators will require new customers, new metrics, new operational procedures and processes, new skills and assets (see below). It will be very, very difficult to build this within the existing organisation structure and operators should consider carving out the new unit and making it a customer of the core business. The core business could even charge the new unit for using the customer and network data and other assets it requires for success. The ‘differentness’ of this future business was brought home to me recently in a meeting with two strategy executives at a leading European mobile operator who said that one of the key barriers to developing a two-sided business model is the current metrics used for business planning. Unless projects are shown to replicate the 40-50% EBITDA margin enjoyed by the current business, they fall at the first hurdle. The two-sided business is likely to be much less capital intensive than the current business so, while it may not generate such highEBITDA margins, EBIT margins could be equally impressive. .
Blyk has done well from a standing start and its 200,000 users are clearly attracting brands.The real value to advertisers (and merchants, governments, developers, enterprises and other upstream customers) is from seriously large numbers of end-user customers willing to accept advertising and other telco-enabled VAS services. This makes the 2-sided telco opportunity most valuable to larger operators OR the operator community working collaboratively. 4. The power of a 2-sided pricing strategy. Blyk isn’t the first company to give stuff away. Google gives 99% of its products and service away to end users and Microsoft gives away its SDK for Windows to developers. What these companies do is subsidise one side of the platform and charge a premium to the other and thus seek to maximise value across BOTH sides. In Google’s case, its efficiency means that it can undercut other advertising channels’ prices and still make a handsome return. The ability to understand and use such a pricing strategy makes 2-sided players tremendously powerful as they can attack the markets of competitors that charge for services that they give away. 5. Cost control remains king. You’ve got your customer base on one side and you are building scale on the other side, so you’re sorted, right? Absolutely not. The platform will only thrive it not only provides an effective service (identification, authentication, advertising, billing, content delivery, customer care, etc.) AND does it more cheaply than can be found elsewhere. Google is winning because advertising is cheap for brands, Microsoft won on Windows partly because the platform, when bundled in with a PC purchase, was negligible. This means that driving costs out of the platform is critical. The high-cost nature of Blyk’s sales model and customer data acquisition is a worry and other operators looking to enter the market should seek to ruthlessly drive cost out of the system. 6. Customer data and CRM is core. Even with its relatively low-tech data acquisition approach, Blyk shows that targeting customers with the right message/product/service/solution really does work. Operators should seek to invest heavily in this area whether they pursue a 2-sided strategy or not because understanding their customers better can only improve the delivery of their own retail services anyway. A strong CRM capability becomes a must-have if they wish to become a platform player like Google. Finally, what is Blyk’s plan for the emerging world of Voice & Messaging 2.0? After all, its target demographic is made up of exactly the same young early-adopter kids who most of the new V&Mplayers are targeting; but its product isn’t really geared to that. For example, they’re keeping a tight grip on the data pipe, and it’s 2G only. And there’s no sign of a developer community. However, Blyk does have capabilities most MVNOs don’t – it has its own complete Nokia Siemens Networks-provided core network, not just an HLR plugged into a partner’s network. So, how long before there’s a Blyk API to play with? Or do they fear cannibalisation too much? 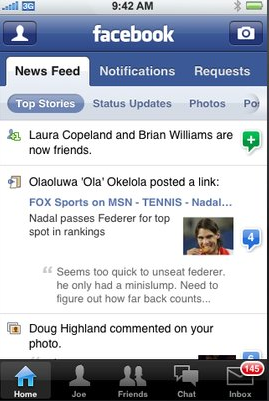 My exp with 1.1 was annoying since you could’nt do a lot of new things that have made facebook even more addictive. Comments on newsfeed items, pic comment from a Div pop up etc etc …. Anyways back to Glue, yahoo’s new search display project. First look and you say what the ***** …… Search for something and you get what looks like a Websites Home page itself…..Disastrous…. I think the whole notion of giving images,video and other media formats relevant to what you search is a bit funny…… HOwever I understand for relatively simple web users this might be helpful…But puttin all the format results in one page ..is it really the best UI idea that Yahoo comes up with????? U’d rather display normal search results with tabs to access video n pics ….which thus keep populating at the back while u browse thru sites ….. Have a look at the Pic and decide for yourself…..dont forget to comment…..
One change i’d love to see in search results display would be to display web pages as(hidden text) very low res pics decently sized ….This because u most of the times know by just having a first look at the page whether its what you searched for…..Well snapping billions of homepages not a herculean task for Google or yahoo …..anyways ive given up one of my best startup ideas…..Any body to invest in me???? O! I’d love to be in the Product Team of Glue, boy do i have some ideas 🙂 kiddin …. Google has made an interesting purchase that savvy watchers of the VC world have noted, in one of those situations where you have to play the shell game of ‘watch the money flow.’ Erasmic Venture Fund is a VC fund backed by Google, one that has put money into very Web 2.0 sounding ventures like Myntra, Dovetail and ChakPak (go check their site to see the logos, you’ll catch my meaning). Erasmic recently threw some money into a Bangalore-based fast food chain named Kaati Zone, whose corporate cultural equivalent in America seems to be Wendy’s. The terms of the investment weren’t disclosed, but the investment itself is funny and easy to poke fun at. For instance, just pondering the question “What interest could Google have in Indian Fast Food?” yeilds interesting results. Perhaps it’s cheaper for them to buy a chain of Indian restaurants than it is for them to set up the legendary cooking staff they have at the Mountain View Googleplex? Maybe they’re starting to tire of owning everything digital and want to truly venture out into meatspace (pun completely intended). Or perhaps they want to organize the world’s data, and the next step in that conquest is to robotize a fast food chain from A to Z.
Yahoo (NSDQ: YHOO), which just announced buying online video tech provider Maven Networks, has quietly relaunched its consumer video service. The service, which has been retooled a few times and hasn’t been a big competition to the likes of YouTube and others, still has the traffic funnel of Yahoo, so has to be taken into contention. The service has a bigger player, better resolution, a better upload tool, and has some new tools for organizing content. This relaunch does not yet incorporate anything from Maven’s acquisition, but one would expect it to be part of the service down the line…which would probably mean an even higher quality video experience. One missing thing for Yahoo is any kind of premium downloads. Would expect this not to be done in-house, and someone like Amazon (NSDQ: AMZN) through its Unbox service could be a partner…after all Amazon has been looking to do such powered-by deals of late. Life goes on at Yahoo: the company has confirmed its previously rumored acquisition of online video platform Maven Networks, although the price tag of “approximately” $160 million is a bit higher than the previous $150 million estimate. The reports first surfaced on New TeeVee and TechCrunch on Jan. 31, the night before Microsoft (NSDQ: MSFT) launched its bid for Yahoo (NSDQ: YHOO). It’s not clear if the delay, however, between the initial reports and the official announcement had anything to do with the bigger issues facing the company. Cambridge, MA-based Maven offers a platform for high-res video hosting and distribution, as well as a system for video advertising. Release. — Maven, which has raised $30 million, has relationships with a number of major content providers, including Fox News, Sony BMG, and “CBS” Sports. Backers include Prism Ventures, Accel Partners and General Catalyst. By comparison, Brightcove, whose CEO Jeremy Allaire was the EIR at General catalyst when the firm invested in Maven, has raised $80 million, since its launch in 2004.